Mycology Research Laboratories, Ltd. has developed a line of mushroom nutrition products (Corpet) for small pets and horses. Fungi have been valued as food and medicine for thousands of years. For over 3000 years the Chinese have used them for their health giving properties and especially as "tonics" for the immune system. One of the most valuable developments in western medicine in the last 100 years, the discovery of penicillin, was obtained from a fungus. 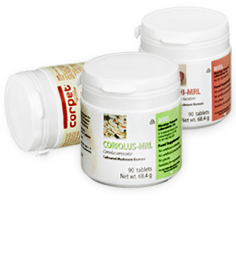 Coriolus versicolor supplementation, has been used in the United Kingdom in both small animals (tablet form) since 1999 and in horses (powder form) since early 2000. In small animals (dogs and cats), Coriolus versicolor has been used to improve the immune state of small animals undergoing chemotherapy as well as for terminal cancer care (i.e. palliative care)(1). More recently, Coriolus versicolor has been used to support the immune system in small animals undergoing a viral challenge from either Epstein Barr Virus or other viral challenges. In horses and ponies, Coriolus versicolor is used to assist the immune system those animals suffering from Post Viral Syndrome which provokes a form of Chronic Fatigue Syndrome. Furthermore, Coriolus versicolor supplementation may improve the state of sarcoids (skin tumours) caused by the Papova virus. Mycology Research has two specific presentations for Corpet. Corpet for Small Pets-Complementary Feeding Product-90 tablets x 500 mg of Coriolus versicolor-biomass. Corpet for Horses and Ponies-Complementary Feeding Product-750 grs with 10 gram spoon of Coriolus versicolor-biomass. Corpet News is a newsletter for health care professionals dedicated to the dissemination of information on the clinical use of it's on animals. Read the latest issues Corpet News here.